Can a drink be like an old friend? Should a drink be like an old friend? It’s way too late as I’m writing this to even begin answering those questions, but I can tell you I much prefer the older version of this prohibition era cocktail to more recent iterations. I actually first found this one in my copy of 1930’s The Savoy Cocktail Book but it appears to date back several years prior. However, later versions that are supposed to be adjusted to modern day tastes failed to impress my personal tastebuds as much as this very simple and basic drink, a rather close relative of the Negroni and the Boulevardier. Still, like an old pal, the appeal of this drink is rather simple and easy to understand – with my favorite brand of wonderfully value priced Canadian whiskey and dry vermouth lightening up my favorite controversial cocktail ingredient, oh-so-bitter, oh-so-sweet Campari. Combine the liquid ingredients in a cocktail shaker or mixing glass. Stir or shake vigorously – I lean slightly toward stirring on this one, for some reason – and strain into our very old pal, the chilled cocktail glass or coupe. Add your lemon twist and toast, I imagine, an old pal. If you don’t like Campari, it’s likely that the Old Pal will be no friend of yours. While the bourbon and sweet vermouth in the Boulevardier puts up a decent fight against the Campari, Canadian Club whisky — which is very specifically called for in the original recipe — and dry Martini & Rossi or Noilly Pratt is simply no match for its undeniable flavors. Even adding a solid, high proof rye whiskey like Bulleit, and increasing its proportion, didn’t change the Old Pal nearly as much as you might think. 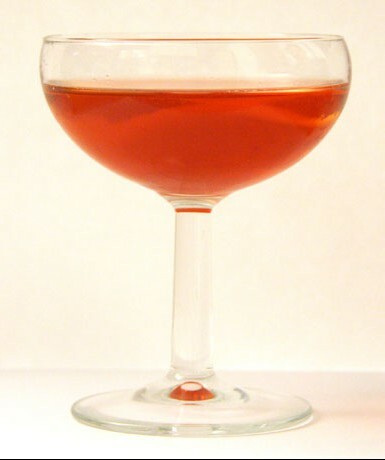 When I tried the more recent variation, which calls for 1 ½ ounces of rye to ¾ of an ounce of Campari and vermouth, it was still very much a Campari-forward drink, only less bright, less crisp. I should have known, you simply can’t change your Old Pal. Not that you should ever want to. Like most Americans, I’m not exactly a polyglot. Four years of junior high and high school Spanish have been of great assistance in helping me to order items at taco trucks; three quarters of college French allow me to chuckle knowingly to myself when “merde!” is translated as “damn!” in subtitles. So, I can’t properly pronounce the name of the Vieux Carre, but I can tell you it means “old square.” That square, as it turns out, is off of Bourbon Street in New Orleans, and this is another fine cocktail associated with America’s most intriguing cocktail capital. Quite obviously, however, this is not in the same category as a Hurricane and it’s not the one of the scary, gigantic green drinks featured on this year’s season premiere of “Bar Rescue.” While, for me, the Vieux Carre doesn’t quite achieve the classic cocktail nirvana of a Sazerac, this is one beverage that actually gets tastier the longer you let it sit. It’s perfect for a long conversation and, by the end of it, even ever-so-justifiably-furious bar rescuer John Taffer might get mellow enough to maybe stop shouting for just a second. 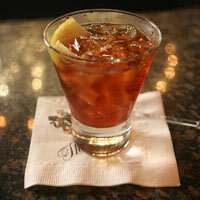 Making this drink is about as easy to make as it is to get a buzz going in the French Quarter. Build over some ice cubes in a rock glass, stir, and add the lemon twist. Toast whatever or whomever you like, but do so slowly. I’m very sorry to say that this week’s post completes my trilogy of drinks of cocktails featuring Camus’s Ile de Ré Fine Island Cognac. Sadly, that’s the case because I polished off the bottle last night. No disrespect to my value-priced go-to brandy, Reynal, but there’s a reason the Camus people get to charge the big bucks for this stuff. It’s great in a cocktail and remarkably easy and pleasurable to drink neat. Good thing I still have a few airplane bottles of various Ile de Ré expressions in my alcohol laden larder. My rye for this double-base spirit cocktail was another new freebie favorite we’ve featured here before, the lovely Templeton Rye, previously featured in the Capone. I usually lean towards higher proof ryes like my old pal, 100 proof Rittenhouse, but that might have been a bit much in this context; Templeton’s more mellow flavor makes it a pretty perfect match for a Vieux Carre. I experimented quite a bit with the other ingredients. Many recipes call for more booze and somewhat less of the Benedictine — a very sweet herbal liqueur which famously mixes well with brandy. I also tried three different sweet vermouths, all favorites. The lightest was Noilly Pratt, which was very nice, but an even better result was achieved with the greatness that is Carpano Antica. (Yet another freebie previously featured here). I also tried it with another great product I’ll be featuring later, Punt e Mes. In that instance, it sort of dominated the cocktail but, since I love, love, love me some Punt e Mes, I didn’t really mind. One final note, apparently to really do the Vieux Carre right, some people suggest you should make it with just one very large ice cube. Sounds cool, but I guess I need to find an ice cube tray that make 3″x 3″ ice cubes. 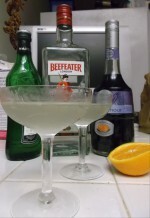 For the second week in a row, I’m revisiting classic variations of classic cocktails that have been mentioned here before but not fully explored. Though supposedly created by an anonymous bartender at New York’s Waldorf Hotel and named for the legendary hero of Scottish folklore, the Rob Roy is a pretty clear case of cocktail plagiarism at its finest. All it really is the Manhattan but made with Scotch rather than with rye, bourbon, or Canadian whisky. Still, as I noted in the second edition of DOTW, a Manhattan is really just a martini made with whiskey and capitalizing on the natural sweetness of rye, bourbon and Canadian whiskey, as opposed to the dry tang of modern day gin. 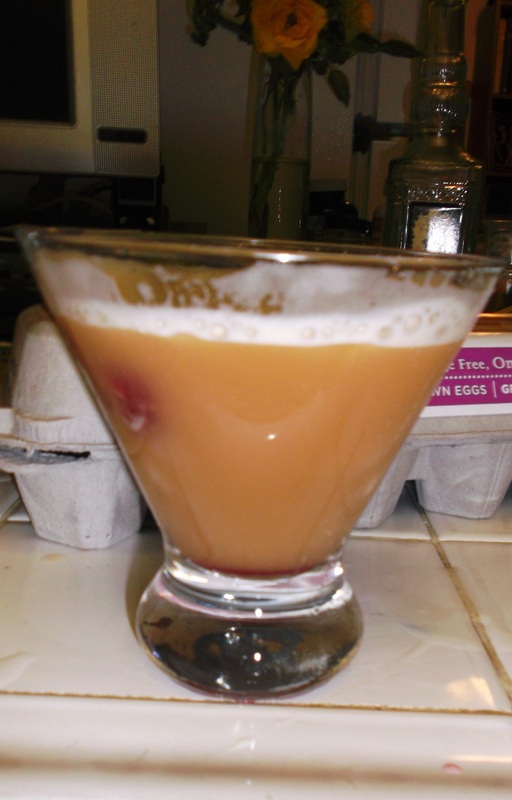 I also said at the time that I hadn’t figured out yet how to make a Rob Roy taste any good. It did take some time to revisit some recipes and experiment a bit with the more smokey and biting flavor of the Scottish brew in comparison to the sweeter rye and the almost-candy-like-in-comparison bourbon. Here’s the trick as I see it right now: We still use bitters, but we use them more sparingly. Add Scotch, vermouth, and bitters — using a light hand on the bitters — in a cocktail shaker with plenty of ice. Shake most vigorously and strain into a pre-chilled cocktail class and sip, preferably while pouring over a volume of Robert Burns’ poetry. It’s true that the best laid plans o’ mice an’ men gang aft agley, and the hole in my plans was that I ran out of my beloved dry Noilly Pratt and forgot to try the dry version of the Rob Roy, which appears to be more popular than the less frequently discussed dry Manhattan. Both drinks simply use dry vermouth in place of the sweet variety and, traditionally, change the garnish from the cherry to a lemon peel or, if you’re me, an olive. If so, I would be extra careful with using Angostura bitters especially as Scotch is already a relatively harsh brew compared to North American whiskeys. 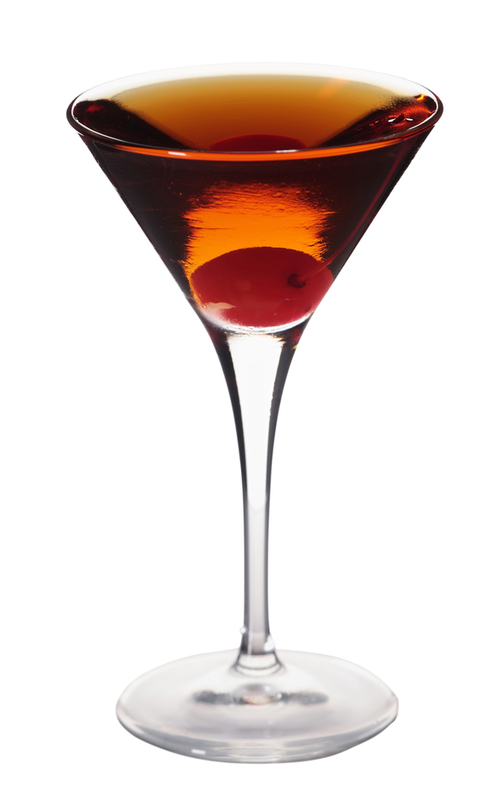 In general, though, to reiterate, the major distinction I would make between the Rob Roy and the Manhattan is that I strongly counsel being stingy with bitters on a Rob Roy, while I counsel greater generosity with them on Manhattans. Scotch is a pretty tough form of booze all on its own.